Despite efforts to improve intersection crosswalks and expand bike paths, crashes involving motor vehicles and pedestrians or bicyclists remain problematic in Madison. And a recent report from the University of Wisconsin-Madison Traffic Operations and Safety (TOPS) Laboratory indicates that a major reason for these continued—and often fatal—collisions is that many motorists don’t understand or obey right-of-way laws. Traffic along Madison’s East Washington Avenue. In February, the Madison Area Transportation Planning Board released the Dane County Bicycle and Pedestrian Crash Study, which included a review of Dane County traffic accident data from 2011 to 2015. 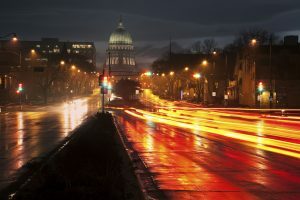 Madison was home to nearly 80 percent of the 1,350 crashes involving cyclists or pedestrians that took place in Dane County during that span, according to the study. Furthermore, nearly 85 percent of bicycle crashes during the four-year stretch occurred at marked intersections. The study identified a number of intersections that are particularly dangerous for cyclists and pedestrians. Recent reports indicate that even marked intersections with crosswalks are dangerous for pedestrians and cyclists. In December 2017, the University of Wisconsin-Madison TOPS Laboratory provided the Wisconsin Department of Transportation with an evaluation of drivers yielding to pedestrians at crosswalks. That report suggests that drivers are confused about how they should respond to pedestrians and cyclists at uncontrolled crosswalks. The TOPS report included a survey of 450 residents from the Madison, Milwaukee and La Crosse areas. While 87 percent of respondents correctly answered that a driver must yield right-of-way to a pedestrian at an unmarked crosswalk on a residential two-lane road, only 66 percent of respondents correctly answered that a driver must also yield right-of-way to a pedestrian at an unmarked crosswalk on a four-lane road. 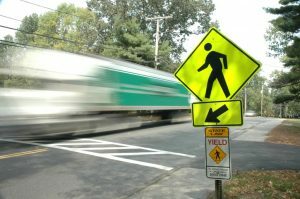 The research likewise found that drivers were less likely to yield to pedestrians at uncontrolled crossings on major, four-lane roads than they were at controlled intersections on two-lane roads. In general, drivers were found to be more likely to yield to pedestrians when the crossing distance was relatively short and when pedestrians clearly indicated their intention to cross (such as by standing directly at the interchange and making eye contact with oncoming drivers). Collisions between motor vehicles and pedestrians or cyclists often result in severe injuries or death to those on foot or bike. Accident victims who survive frequently face a long recovery period and overwhelming medical expenses. In fact, research cited in a 2017 Reuters article found that both the number of people injured in bike crashes and the medical costs associated with each crash have risen over the past two decades. That research linked the rising medical costs to a growing number of riders age 45 and older and an increasing number of collisions that involve cyclists and motor vehicles. The Madison personal injury lawyers at Boller & Vaughan are dedicated to helping crash victims recover the financial security they need to cope with medical expenses, lost wages and other damages in the aftermath of an accident. If you were hurt or a loved one was killed in a crash caused by a negligent driver, please call us at 608-268-0268 or contact us online. To stay informed about issues that affect your safety on Madison’s roads, follow us on Twitter or “like” us on Facebook.